Royal Caribbean International marked an important milestone Feb. 1 as the first piece of steel was cut for its second Quantum Ultra Class ship at the Meyer Werft shipyard in Papenburg, Germany. The 27th ship in the global cruise line’s fleet is set to be named Odyssey of the Seas. Set to debut in fall 2020, Odyssey will sail from the United States. Additional details on Odyssey will be revealed later this year. 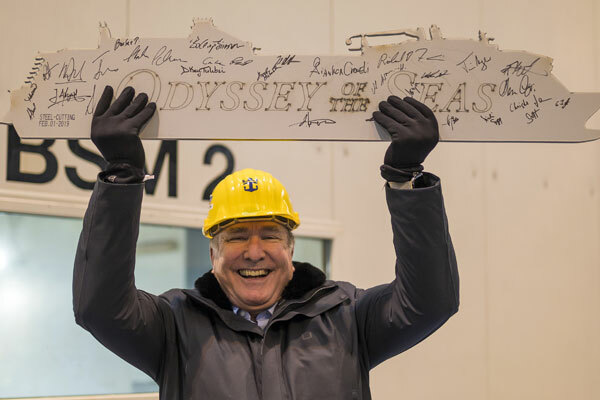 Pictured, Richard Fain, chairman and CEO, Royal Caribbean Cruises Ltd., who was on hand to announce that the ship will be named Odyssey of the Seas and debut in the fall of 2020 out of the United States.